If you’re serious about becoming an Excel programmer, you’ll spend a lot of time with VBA modules on your screen. To help make things as comfortable as possible (no, please keep your shoes on), the VBE provides quite a few customization options. When the VBE is active, choose Tools → Options. You’ll see a dialog box with four tabs: Editor, Editor Format, General, and Docking. Below, you see the options available on the General tab of the Options dialog box. In almost every case, the default settings are just fine. 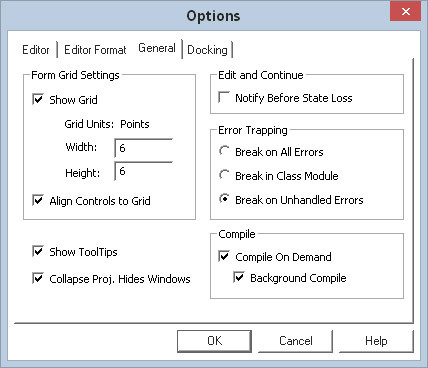 The General tab of the Options dialog box. The most important setting is Error Trapping. You should use the Break on Unhandled Errors setting (which is the default). If you use a different setting, your error-handling code won’t work. If you’re really interested in these options, click the Help button for details. Check out the Docking tab below. These options determine how the various windows in the VBE behave. When a window is docked, it is fixed in place along one of the edges of the VBE program window. This makes it much easier to identify and locate a particular window. If you turn off all docking, you have a big, confusing mess of windows. Generally, the default settings work fine. 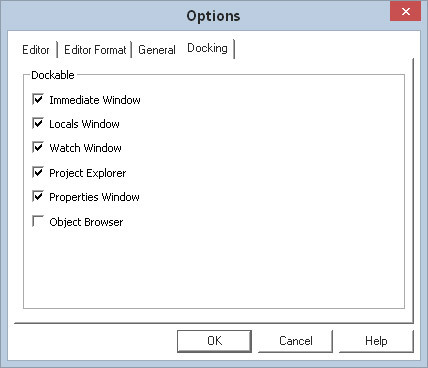 The Docking tab of the Options dialog box. You’ll find that sometimes the VBE seems to have a mind of its own when you’re trying to dock a window. If docking doesn’t seem to work correctly, just stick with it, and you’ll get the hang of things.